Here's one of London's oddest bus services... a school bus which still runs in the school holidays. Every schoolday TfL run dozens of school buses, each numbered in the six hundreds, for the benefit of nomadic students. Adults stay well away, there being no joy in boarding a capsule full of excitable teens. But the 603 is unique, running for the benefit of schoolchildren on schooldays, but for everyone else when school's out. Two vehicles run south from Muswell Hill to Swiss Cottage every weekday morning, twenty minutes apart, then turn round and come back again. The return journeys are too late to be of use to schoolchildren, but run every weekday all the same. Something very similar happens in the afternoon. Below is the timetable for non-schooldays, when services are scheduled to run at approximately the same time, but fractionally faster. But why bother? Why operate a London bus route with an eight hour gap in the middle of the day (and nothing in the evening), which is sometimes invaded by blazered children and sometimes not? I waited for the safety of the Easter holidays and took a ride to find out. Surprise number one, the 603's a double decker, even on a non-school day when no raucous hordes will be boarding. It arrives on Muswell Hill Broadway a few minutes early, with Not in Service on the blind, swings round the roundabout at the far end and then parks up, because it would never do for such an infrequent service to be early. Stop number one is opposite a church converted into a steakhouse, and outside a swanky 'Butcher & Providore' selling charcuterie and boxed cheese, because Muswell Hill's affluent like that. It should come as no surprise that the 603 exists mostly to ferry children to private schools. I'm not expecting any other passengers to join me on the half past three. I am wrong. A lady with a shopping bag flags down the bus with her Oyster card, keen not to miss the last bus of the day. Another gentleman follows her aboard, and a third shopper is waiting at the first stop down the road. When a fourth boards I start to wonder whether they've been waiting specially, or whether they're aiming for East Finchley and just hopped on whichever of the three routes turned up first. 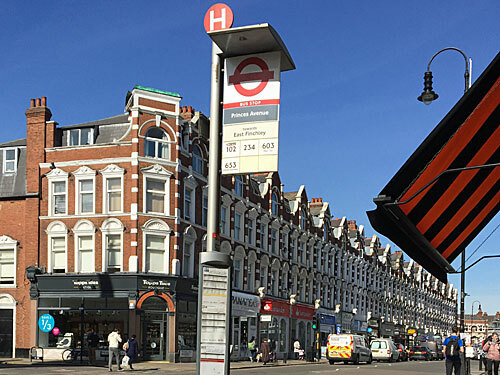 Fortis Green is very pleasant, a mix of Victorian villas and 60s flats, interspersed with florists, butchers and tasteful Mediterranean restaurants. Here we acquire four more passengers in one fell swoop, half of them schoolchildren in their non-spare time, as all my predictions regarding ridership go out the window. The dry cleaners on the corner has a depressing message in its window, "Be prepared, have your warmer clothes cleaned now", although from the look of the lettering I suspect it's been there for innumerable autumns. 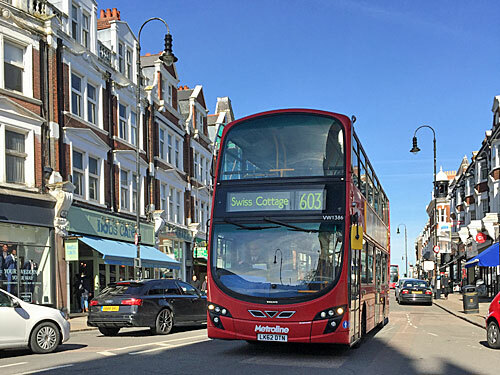 It's my rule every time I blog about a bus along this stretch of the High Road that I have to mention Amazing Grates, the fireplace showroom, and probably the Bald Faced Stag nextdoor. It's here that I first notice our driver is in no real hurry to get anywhere, as he pulls in at an empty stop nobody's dinged to get off at, flaps his doors briefly, then drives off. A heck of a lot more pointless flapping is coming up, almost as if the timetable has been deliberately padded out... except that this is the non-schoolday schedule, so it has absolutely no need to be. Here's the Phoenix cinema, here's the Archer atop East Finchley station, and here are some temporary traffic lights, which our driver embraces optimally to waste another minute. A few passengers are starting to alight now, which is intriguing because they could probably have caught the bog standard 234 which was running a couple of minutes ahead of us, but chose the big rare bus instead. From the Esso Garage onwards, however, the 603 breaks off on its own, a genuinely useful onward connection from Muswell Hill, but running only four times a day. North Hill is very pleasant, a soon-to-be leafy climb to Highgate, currently with branches brushing against each other high above the middle of the road. Another passenger joins us here, preferring our bus to the 143 that's normally the only bus up this stretch. We meet a 143 just past the next stop, obstructing the middle of the road with lights flashing and the door to its engine wide open. The driver is standing outside his cab, cigarette in hand, waiting patiently for mechanical deliverance. He breaks off for a while to help usher us through the awkward gap alongside his malfunctioning vehicle, then waves us off and grabs another puff. Appreciators of modern architecture should watch out (on the right) for the glories of Lubetkin's High Point. Schoolchildren should watch out (on the left) for Highgate School, educational institute of legend, which is the chief reason route 603 exists. Today the memorial gates are locked, the chapel stands silent, and the steps up to the main door sparkle in the spring sunlight. Term restarts on the 17th of April, if you're interested in nipping along before the kids come back. 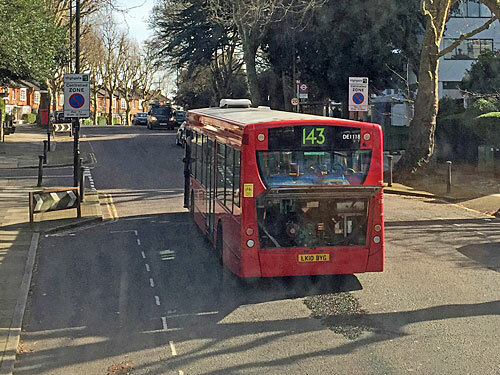 We turn right onto Hampstead Lane, which again no other bus does, to shadow route 210 across the top of Hampstead Heath. I am once again surprised when three more passengers board, one of them with a heavy suitcase, suggesting they've deliberately chosen our wilfully irregular service. Luggage man stays downstairs, but the posh young couple troop upstairs and shatter the silence on the upper deck, squishing into the other front seat and opening up a whole new layer of narrative. "Omigod I love sitting at the front of the bus!" says the female of the pair, suggesting today's journey is a somewhat rare treat. She peruses the big houses, the high brick walls and the playing fields and declares "I feel like we're in Gerrards Cross", before squealing excitedly in the direction of Kenwood House. Her gentleman friend takes the opportunity to move in for a protracted snog and fumble, behaviour more normally attempted on the back seat by youngsters half their age, which I try my very hardest to ignore. "What's that smell?" is the lady's somewhat unexpected response when the embrace finally breaks up. She rescues the situation somewhat by adding "It's really nice", and is delighted to discover she's been inhaling Chanel. She then proceeds to explain how her house shakes whenever a bus goes past, but not like in an earthquake, and is particularly excited when we squeeze past The Spaniards Inn. "This is so North London," she tells her other half, with blinkers fixed, as if every building this side of the Thames has 'circa 1585AD' painted on the front. I want to lean over and suggest she visits Tottenham or Colindale sometime, but think better of it. The sun glints on the ripples of the Whitestone Pond at the top of the Heath. I watch as a heron swoops down from the top of a lamppost to land in the reeds, before stretching its wings and flapping off in an ostentatious arc towards the Vale of Health. My top deck partners have their eyes on their phones, and see nothing. Perhaps more surprisingly we're still picking up passengers, even at stops that wouldn't normally have buses going the way we're heading. Indeed the 603 is the only daytime double decker to head down Heath Street, into the affluent twists of Hampstead, and I revel in the unusual lofty view. "This is us!" says the woman as we approach the station, before warning her partner to stay seated until the bus stops, as if he were her six year-old son. They only just alight in time. We push on down Fitzjohn's Avenue, now shadowing route 46, past all sorts of places the moneyed might head for nibbles. Again the houses are grand and expensive, with one particularly haunted example shrouded in a cloak of jungle foliage. Here our twentieth and final passenger flags us down, only for a few stops, but validating this peculiar service's unlikely existence. Most passengers alight just before the Swiss Cottage roundabout, where our driver takes one last opportunity to wait for several unnecessary seconds to ensure he terminates two stops later at precisely the correct time. Outside the Hampstead Theatre a canopy of cherry blossom shields an outdoor gym space where dozens are freely exercising. Only two people are sat on the chalet terrace outside Ye Olde Swiss Cottage ingesting pints, and exhaust fumes, in the spring sunshine. And only I ride to the final stop opposite the Odeon, a bus stand specifically for route 603, hence used for just an hour a day. I'm still left asking myself, why does route 603 exist? It's good at making connections no other routes manages, indeed you'd need to catch five separate buses to follow the same route we've just traced. In particular you'd think Highgate to Hampstead deserved a permanent link, but instead a change of buses (or a hike across the Heath) is still required. But oddest of all is the decision to run the service on days when schools are closed, scheduled annoyingly infrequently, at times no commuting adult would be likely to find useful. Here's what TfL said in response to a Freedom of Information request in 2014. 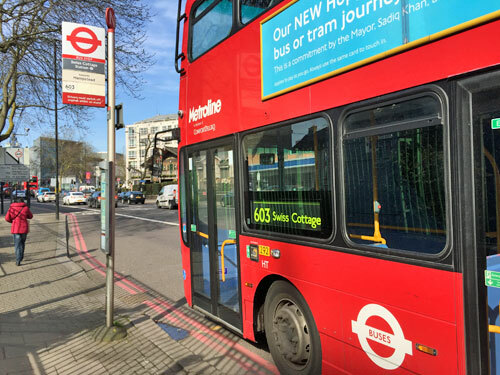 "We have looked a number of times at running the 603 as an all-day service but we do not consider that the demand would be sufficient to justify the service, given the existing bus links in the area. There has also been consideration of extending and/or altering those bus routes already serving the area but we consider the patronage would not be enough to make the additional cost worthwhile. Ultimately, we have to make sure that we use the resources available to provide services that will benefit the majority of passengers." That final economic argument rings hollow, especially this week, as the 603 shuttles back and forth collecting absolutely no schoolchildren whatsoever. But someone somewhere must think it's worth running a school bus in the school holidays, and I for one am glad they do, because I got to enjoy a properly interesting and often scenic ride. You have just over a week to embrace the opportunity before those pesky private pupils steal it back.